It all started on February 21, 1989. Pete Rose just met with the commissioner Peter Ueberroth and Commissioner-elect Bart Giamatti. 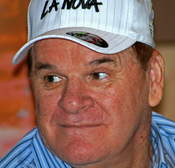 The two officials accosted Pete Rose to discuss his gambling habits. Rose defiantly declared, "You can read anything you want into it. But I don't see anything bad." Unfortunately for him, on March 20, 1989, just one month after the first meeting, Ueberroth announces that Reds manager Pete Rose is investigated for "serious allegations." After weeks of legal investigations, commissioner Giamatti irreversibly bans Rose from baseball for his alleged gambling on baseball games on August 23, 1990. Both Pete Rose and the Giamatti signed an agreement that Rose will be permanently ineligible in accordance to Major League Rule 21, despite the fact that the 5-page document was signed with no formal evidence. Giamatti considers that Rose accepts the ban to be a no-contest plea. Earlier in 1989, Rose confessed to illegally betting on NFL, NCAA and NBA games, but he denied betting on baseball. Should gambling on games deny Pete Rose admission to the Hall of Fame? If the answer is yes, then why was Adolf Hitler selected Man of the Year by Times magazine? Hitler murdered millions of innocent people and started a world war. If Pete Rose only gambled on professional games, then he should be admitted to the Hall of Fame. Steve Howe is another example. He was banished 11 times for drug abuse, but he was let back into the game. WriteWork contributors. "Pete Rose in the Hall of Fame" WriteWork.com. WriteWork.com, 05 October, 2004. Web. 19 Apr. 2019. Interesting story. Gives many evidence to support the article.